Gamecock 'Bama Game Brings ESPN GameDay and Die Hard Fans | South Carolina Personal Injury Attorneys | Criminal Defense Lawyers - Strom Law Firm, L.L.C. ESPN is already setting up this morning to broadcast GameDay from the University of South Carolina Horseshoe. Drawing a larger crowd to an already sold out event. So whether you plan to camp out tonight for GameDay, plan to tailgate tomorrow, or are lucky enough to have tickets for the game, we remind you that law enforcement will be out in full force targeting driving under the influence (DUI) and underage drinking. Anticipating the arrival of the number one team in the Country tomorrow, football fans may also be arrested and charged with disorderly conduct for being grossly intoxicated, behaving in an unruly manner, and using profane language in a public place. The South Carolina Department of Public Safety reported that as of August 16, 2010, the South Carolina Highway Patrol has arrested 9,535 people for driving under the influence. The State Highway Patrol and State Transport Police are working together with local and state agencies through the SC Law Enforcement Network to crackdown on drunk driving. The Highway Patrol also has a 30-member team which concentrates solely on impaired drivers. Football tailgaters should be reminded that there may be check points set up around the football stadium, so drivers should think twice before getting behind the wheel if they have been drinking. Remember, if you are stopped at a check point and questioned about whether you have been drinking alcohol, you have legal rights. After a long day of tailgating and drinking, getting home safely is a major concern. This may lead some to make the unwise and potentially deadly decision to drive under the influence. So, what’s the better solution for those of us who want to get our car home, avoid unnecessary towing expenses, and that dreaded trip back downtown to get your car? Call Valet US. Located here in Columbia, Valet US serves the local area through a fleet of scooters which fold up neatly and can be placed in your trunk. They provide a safe ride home for you and your car or truck. Once you and your car are home safely Valet US takes the scooter out of the trunk and your driver is on his or her way. They can be reached at 803-528-6559. The good news for South Carolinians is that the number of alcohol-impaired driving deaths in the state has decreased from 400 in 2008 to 377 in 2009. Moreover, the overall number of traffic fatalities has declined since 2008 by 2.9 percent and is expected to decline even more in 2010. In the unfortunate event that you are arrested and charged with DUI or any other alcohol related offense. 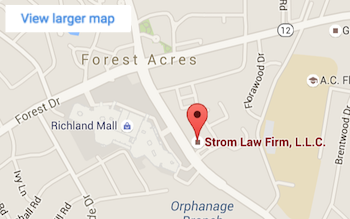 The DUI lawyers at the Strom Law Firm will work to establish a strong defense against your drinking and driving charge. The stronger the defense, the more likely the prosecution will be willing to reduce your charge to reckless driving. Although a reckless driving conviction may require you to enroll in DUI classes or participate in an alcohol treatment program, this option may preserve your future. Founded by a former U.S. Attorney, the team at Strom Law also includes a former Public Defender, and a former Assistant Attorney General and Richland County Assistant Solicitor. It’s awarded the highest Martindale-Hubble ranking and collectively holds more than 50 years of complex litigation experience. Our DUI defense attorneys will evaluate your case at no charge. Fill out the Free Case Evaluation form on the right or call us immediately. Let us fight your DUI charge, and help you protect your freedom and financial future. We offer flexible payment plans and accept Visa and Mastercard.